In January of this year, I accompanied Bob Perachio of Elegant Bliss as the second shooter for the wedding of Shannon & Mike. 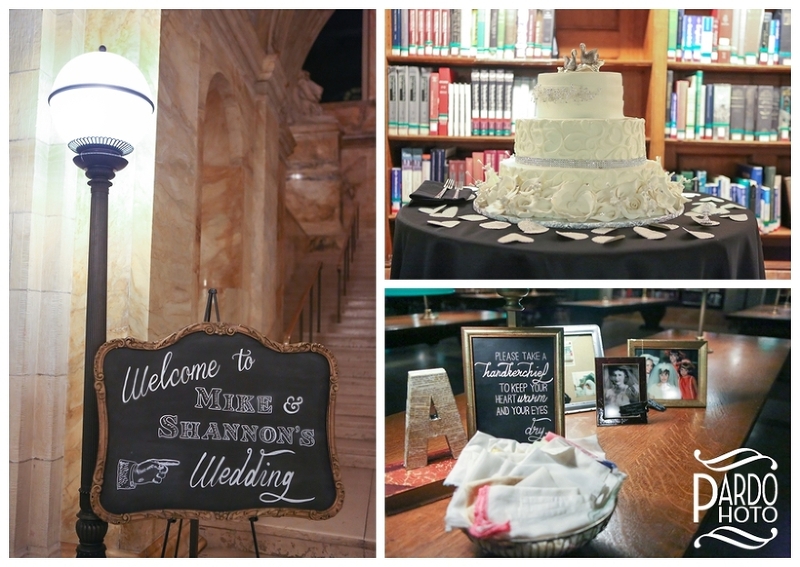 The couple held both their ceremony and reception at the Boston Public Library. I love photographing weddings as a second shooter, it allows me to focus on the details and be more creative. This wedding was no exception! I arrived and met up with Mike and his groomsmen in an old part of the library. It felt like an old subway station. There was an old bench with cracked white paint that I loved and was able to get some shots of the guys in their dapper outfits. They were playing the part of the classic cool guys in their tuxes but my favorite photos are of them laughing. You could tell how excited they were to be there on this special day. Then I went upstairs to the main reception room to photograph the details. The decor was simple and I love the use of the key. Shannon planned all the details from the books the flower girls carried, to the hearts cut from book pages sprinkled on the floor and around the cake and all the signs. All of the tables had family photos with descriptions. It was an impressive array of DIY details and it perfectly matched the location. The ceremony began and as a second shooter I try to get the groom’s reaction, parent reactions and close ups of the bride. These are the moments that fill in the overall story already covered by the primary photographer. I love the shot of them kissing with the clock above their heads… it marks the exact moment they were pronounced husband and wife. It’s extra special to me because I was able to see that angle knowing I would not have been able to do that had I been the primary shooter. At that moment Bob was in the center of the aisle getting a wide shot with the couple kissing in order to incorporate the architecture of the library. Because I did not have to worry about the architecture I was able to see the clock and the kiss. To add some pomp and circumstance after the ceremony, Shannon hired a marching band to walk down the aisle after them and follow them out. The band, the Boston Circus Guild, was AMAZING and they stayed to play during cocktail hour. 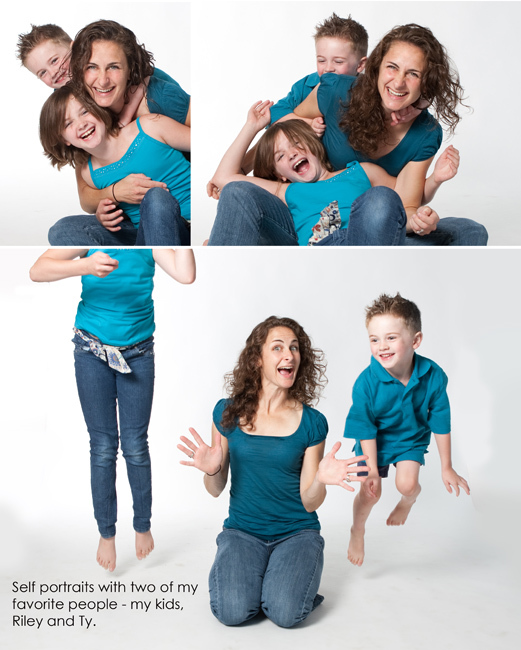 As they played, I stayed in the room and Bob was able to get some family shots. Then I shot alongside Bob as he pulled the couple out for some portraits. Shannon and Mike were so wonderful and we were able to get some beautiful images. 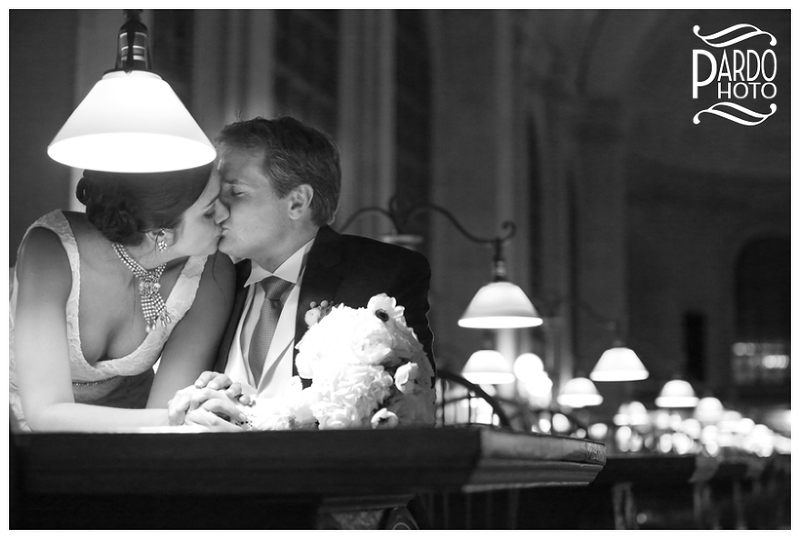 I love the image of them kissing seated at the desk in the library. It is so romantic especially with the patterns the lights make leading up to them. When the reception began, Shannon and Mike had their first dance. After the food catered by The Catered Affair was served and enjoyed, Mike stood up and serenaded Shannon – completely to her surprise! The marching band had been a surprise from Shannon to Mike and the serenade was a surprise from Mike to Shannon. I loved how they each had something up their sleeve for the other. It was wonderful! Happiness was the feeling for this entire wedding, I was impressed they were all so jovial considering it was the night of the Patriots playoff game. I fully expected to see iPads and phones with the game playing but I didn’t. Everyone was emotionally present, especially Shannon & Mike, and you could see and feel it all night long. Thank you to Bob for asking me to shoot by your side and to Shannon and Mike for allowing me to share in your happiness. 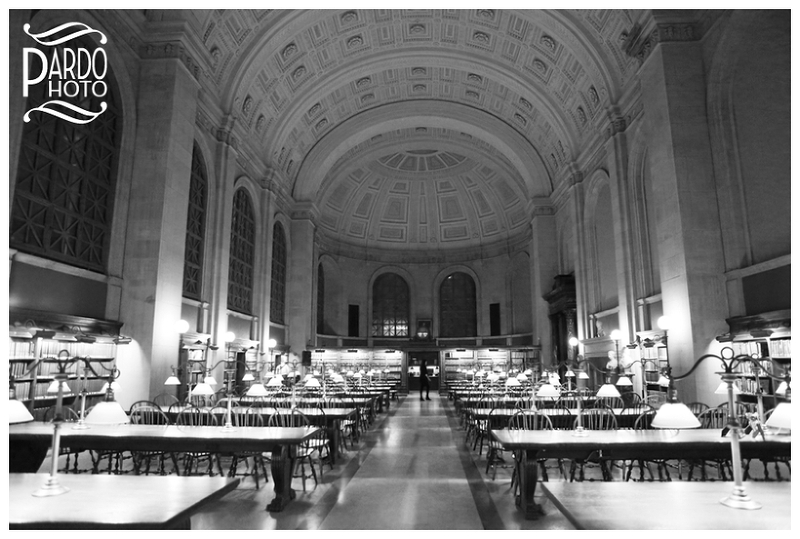 Photographing a wedding at the Boston Public Library has been an aspiration of mine for years, as I love the architecture, the ambiance and and the detail. I look forward to shooting there again someday soon!